They were so proud of their handiwork! 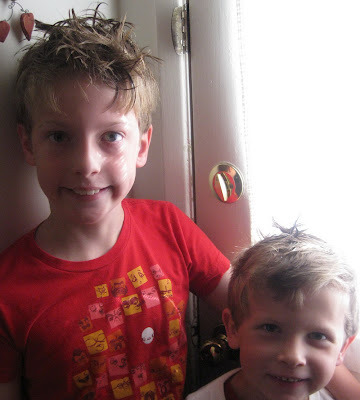 I mentioned that it wasn't "crazy hair day" at school, and Nathan replied, "I know, that is why we didn't make it crazy." Uh huh. I have firmly resolved that hair will not be an area of conflict in our home (says the girl who changes hair color with the seasons), so off to school they went, pleased as punch with their lovely new do's! not an area of conflict until they push a button huh?? too funny... so what has happened to your hand?? I keep seeing you comment about it - but I guess I missed what actually happened?? ?